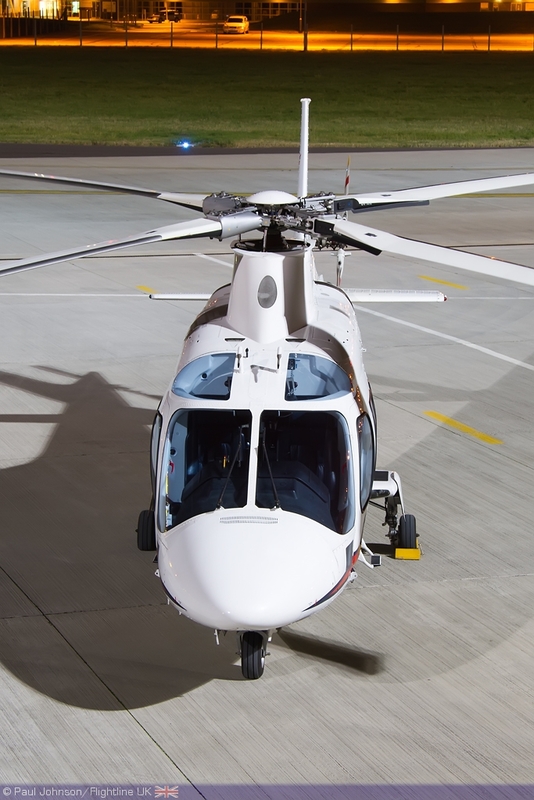 The airshow season may be over for 2012, but there’s no shortage of other events over the dark winter months for enthusiasts to get their aviation fix. 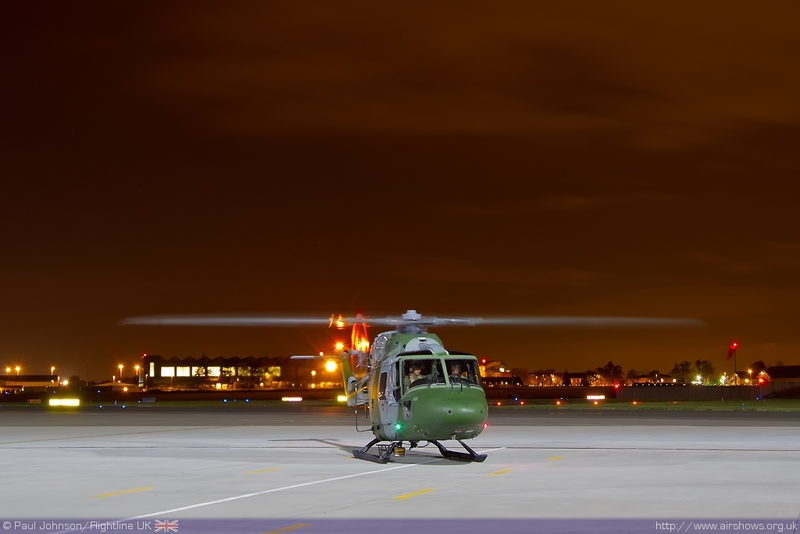 The RAF Northolt Night Photoshoots are amongst the most popular and have gained something of a cult following. The latest edition of the event took place in mid-October and was one of the best to-date. 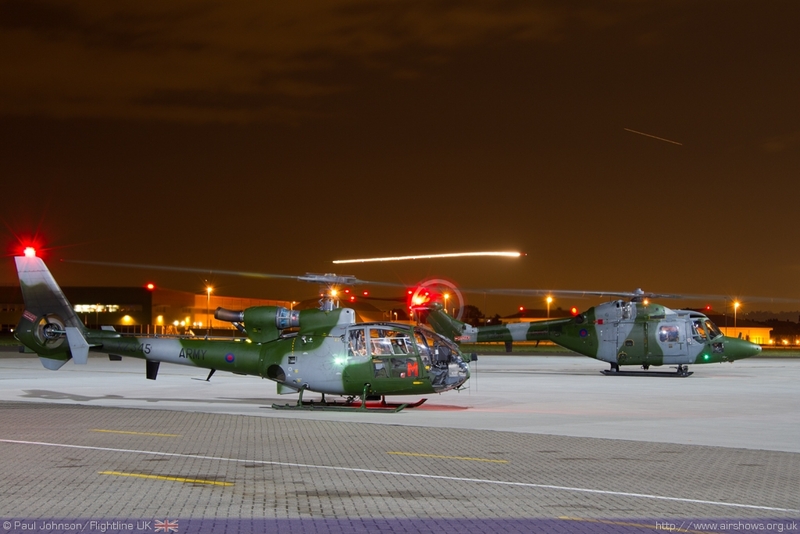 Northolt ‘Night-shoots’ have seen an incredible variety of aircraft since they began. 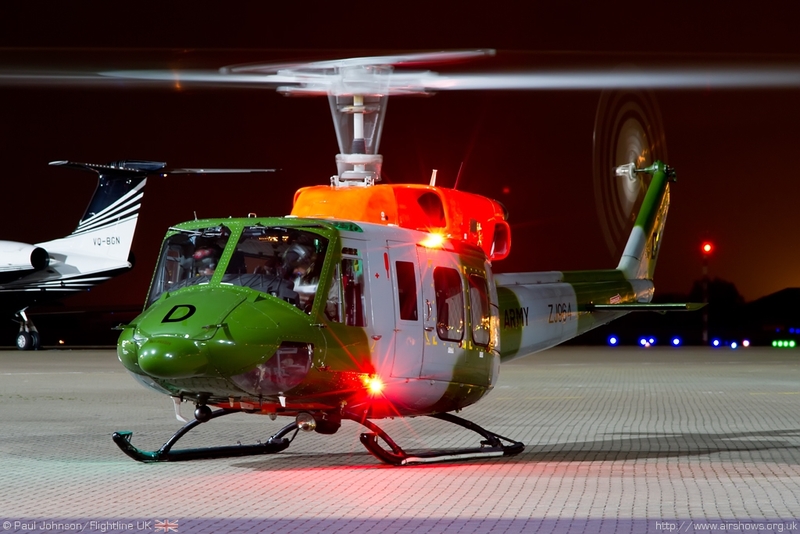 Amongst the favourite types of aircraft at these events are helicopters with the long exposures necessary to capture high quality images in low light lending them wonderfully to capture rotors turning. It was therefore something of a bonus that the entire line-up of inviting aircraft consisted of rotary types. The only fixed wing type that was available for photography was a 32 Squadron BAe 125 CC2 that have arrived back from operations as the Night-shoot got underway and was soon put back in the hangar. 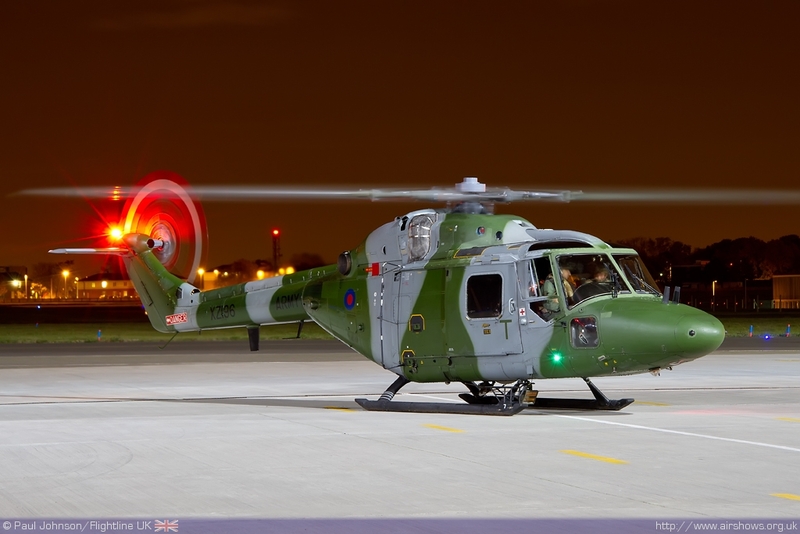 It was great to see such strong support from the UK armed forces for this shoot. 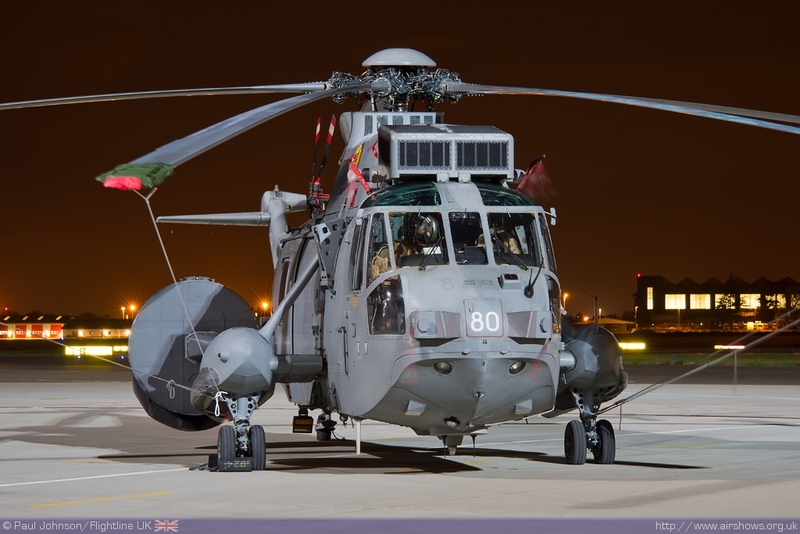 The senior service, the Royal Navy, sent an 854 NAS Westland Sea King ASaC7 for a rare appearance. 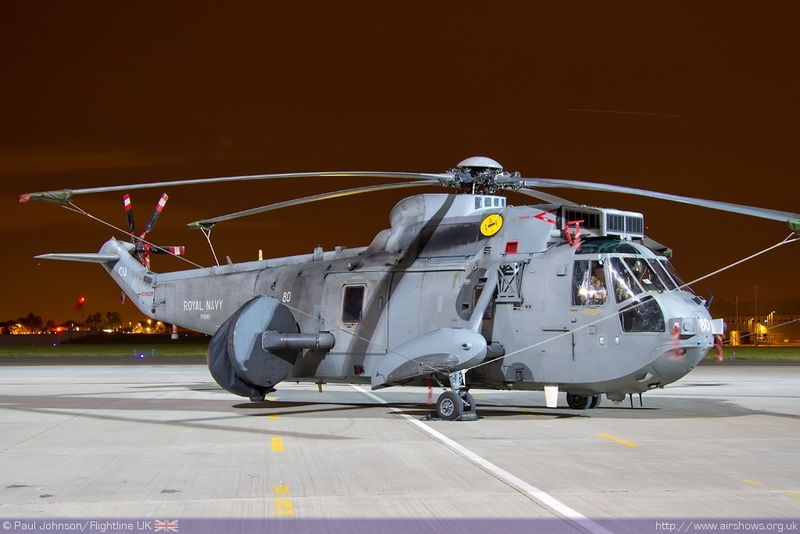 The type has been very busy supporting NATO-led forces in Afghanistan recently, but is coming to end of its service life and will probably eventually be replaced by an AEW equipped variant of the Merlin. The Royal Air Force also had a good presence. 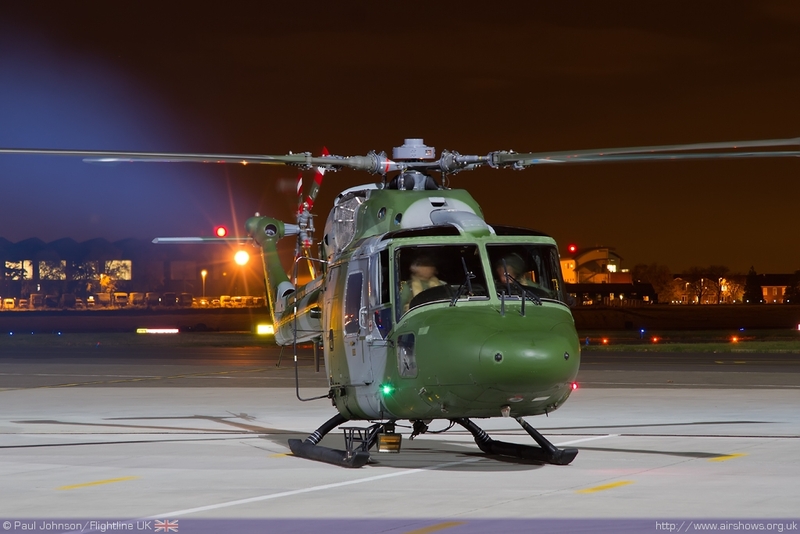 Northolt based 32 Squadron had one its Agusta A109 helicopters positioned under the floodlight throughout the evening. 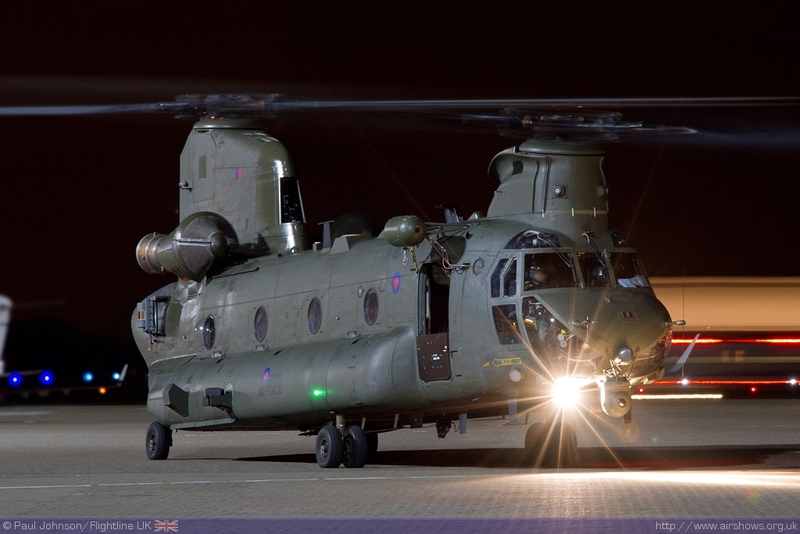 However, one of the stars of the evening was a Boeing Chinook HC2 from 7 Squadron which dropped in for a short stop and go for the photographers. 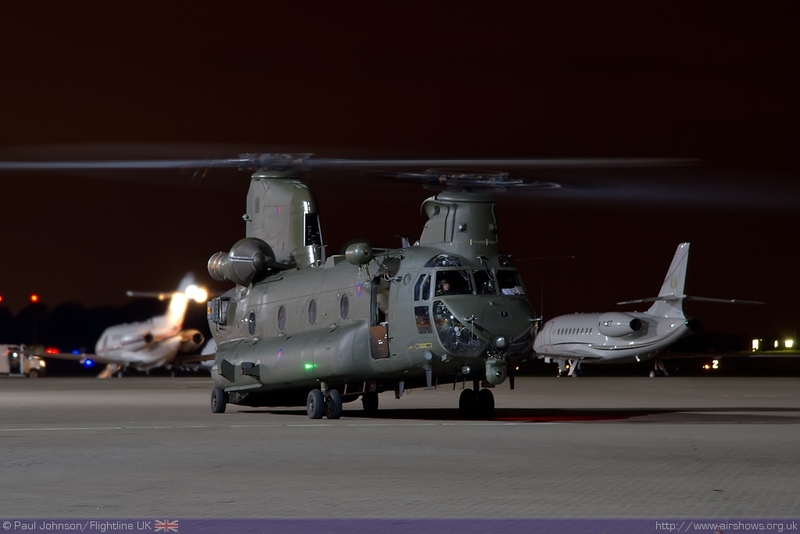 7 Squadron provides support for the UK’s Special Forces and its Chinooks sport a variety of ‘extras’ to fulfil the role. 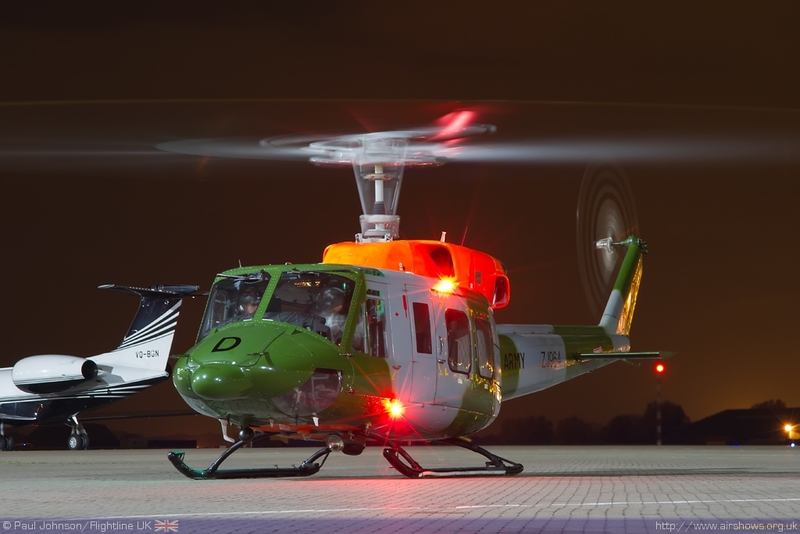 The Army Air Corps provided the biggest contingent with three very different helicopters. 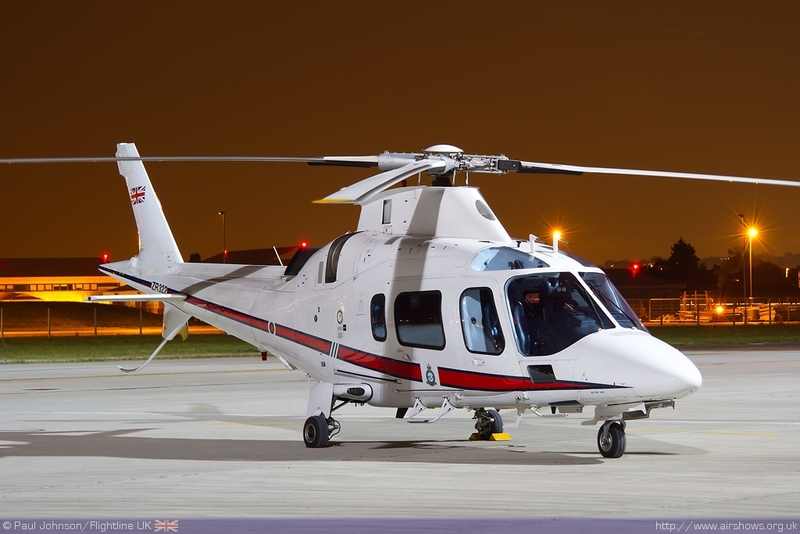 The Bell 212 from 25 Flight is a relatively rare sight in the UK, and was a very welcome addition to the line-up with its distinctive rotor slap. 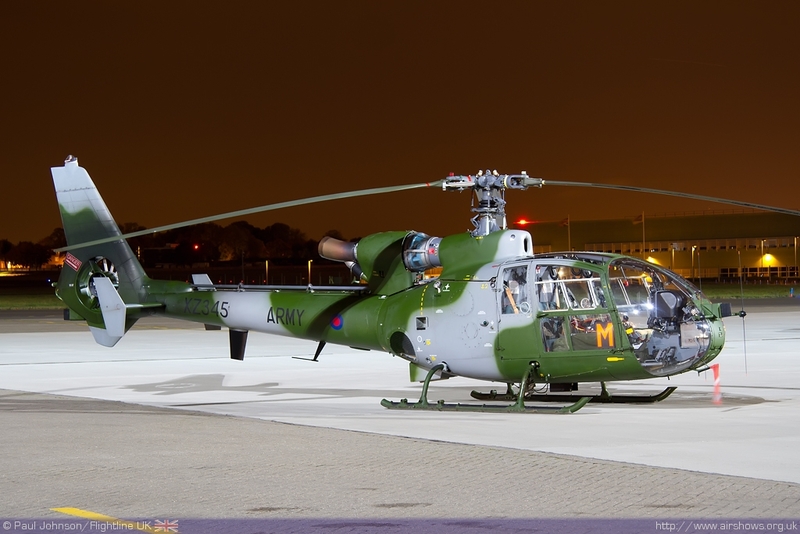 The Bell 212 is currently used for supporting the British Army operations in Brunei, and has become slightly more common in UK skies since the withdrawal of the type from Belize. 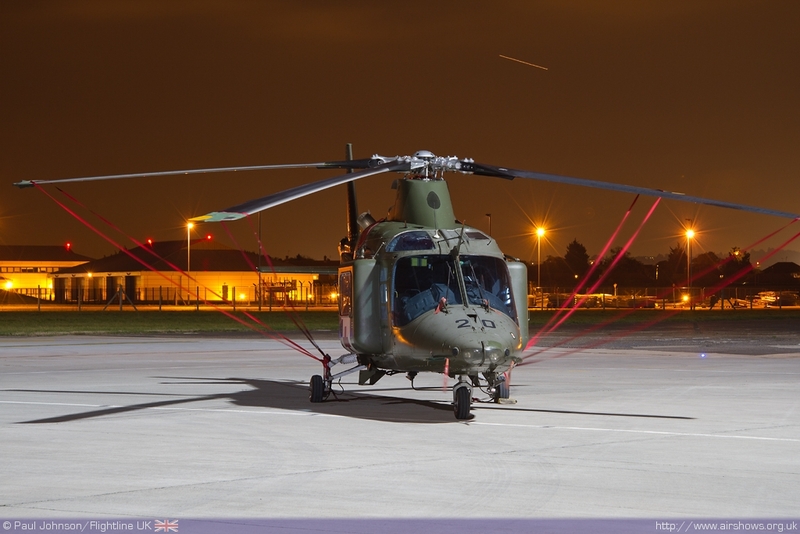 The UK based examples are based at Middle Wallop and are used to convert Army pilots and aircrew to the type. 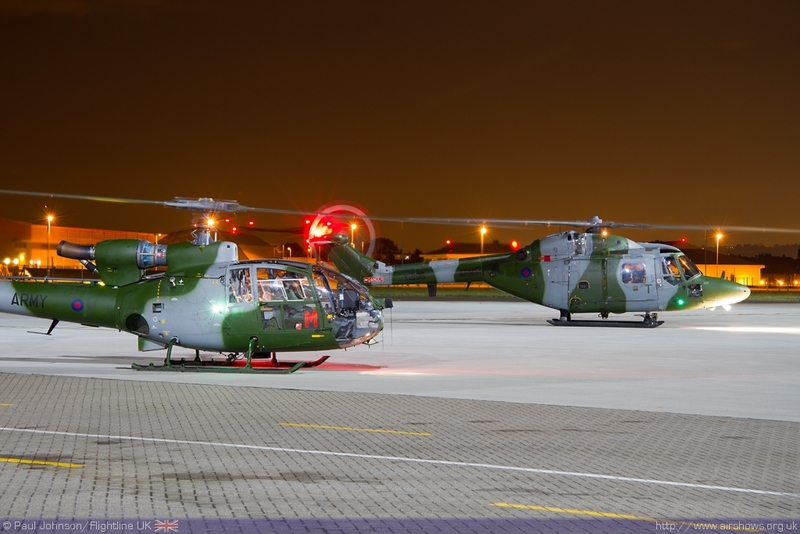 The other two helicopters both represented types slowly being withdrawn from service. 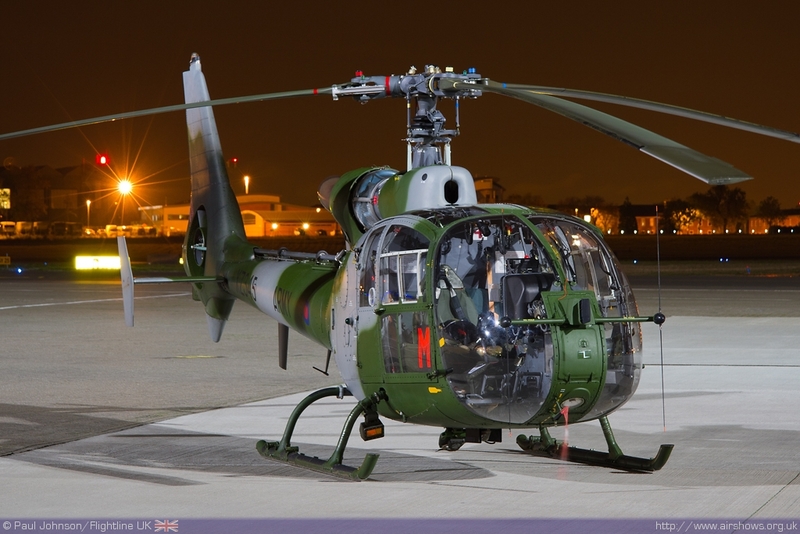 The Gazelle AH1 is in the twilight of its army career, and has long been on the wish list for organiser Phillip Dawe. 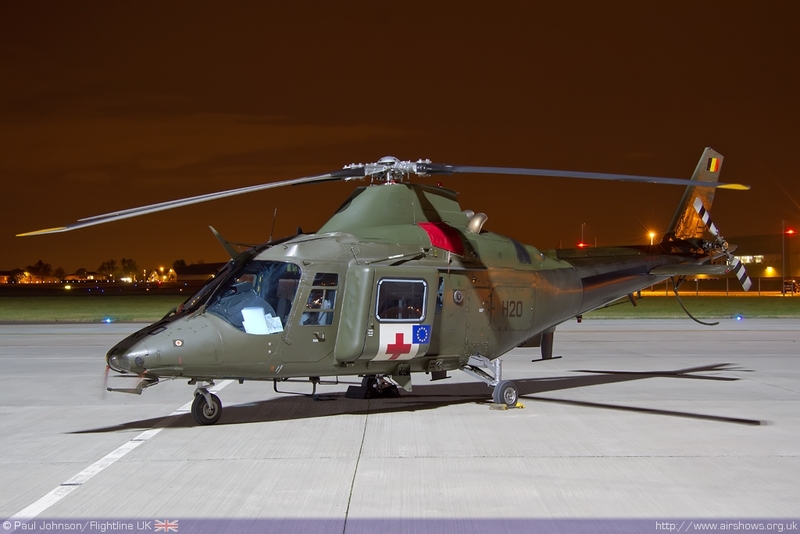 It appeared alongside a Lynx AH7 which is also now facing retirement with the introduction into Army service of the AgustaWestland Wildcat as well as the more potent Lynx AH9A with its wheeled undercarriage in place of the AH7’s skids. 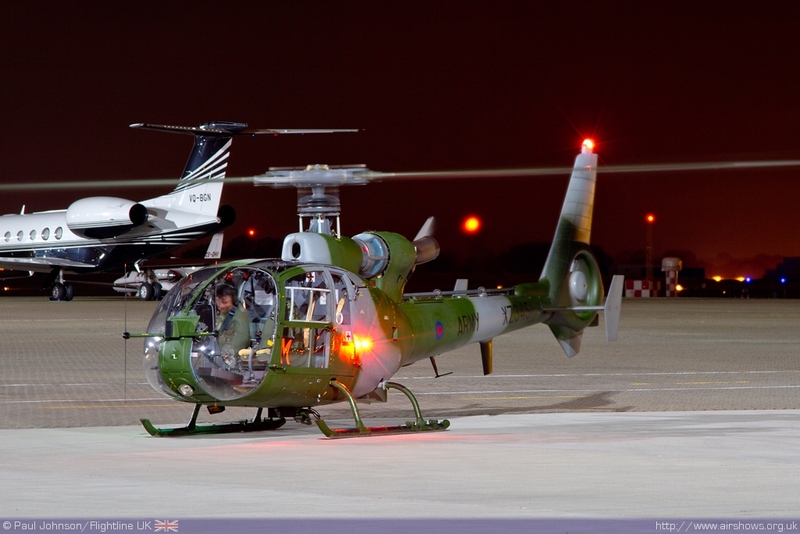 Both the Gazelle and Lynx departed together making for a very unique opportunity for the photographers of capturing two helicopters running together. 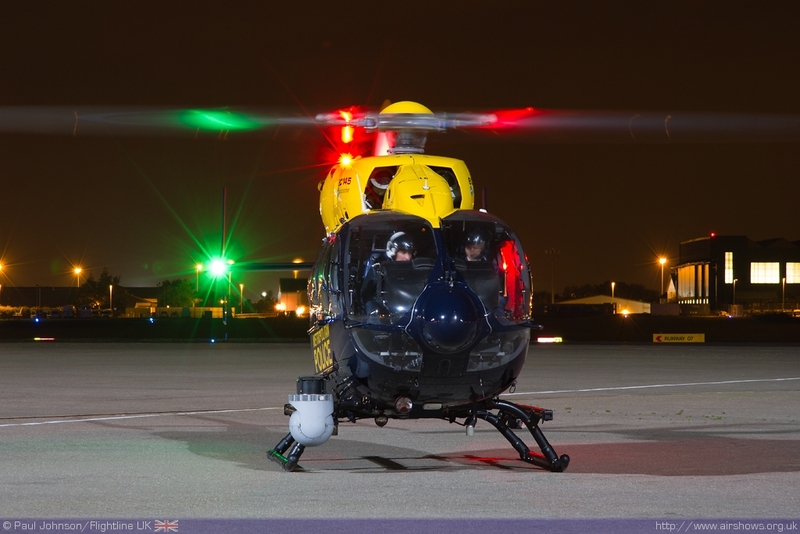 A further UK based participant was the Metropolitan Police’s Eurocopter EC145 which is something of a regular visitor to Nightshoots, but makes for an excellent photographic subject on each occasion. The aircraft were also supported by vehicles from the RAF Regiment including the Jackal armoured vehicles as well as an historic Willys Jeep. 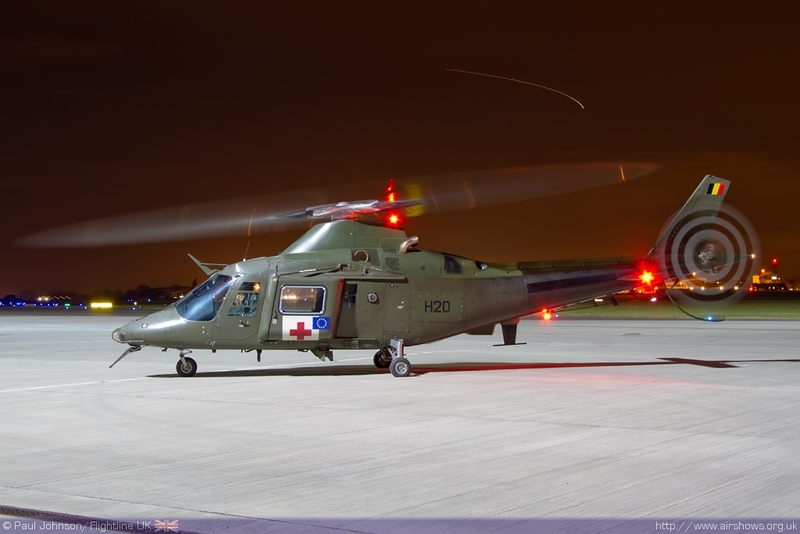 The Belgian Air Component was the sole overseas participant for Nightshoot XIII with an Agusta A09BA. 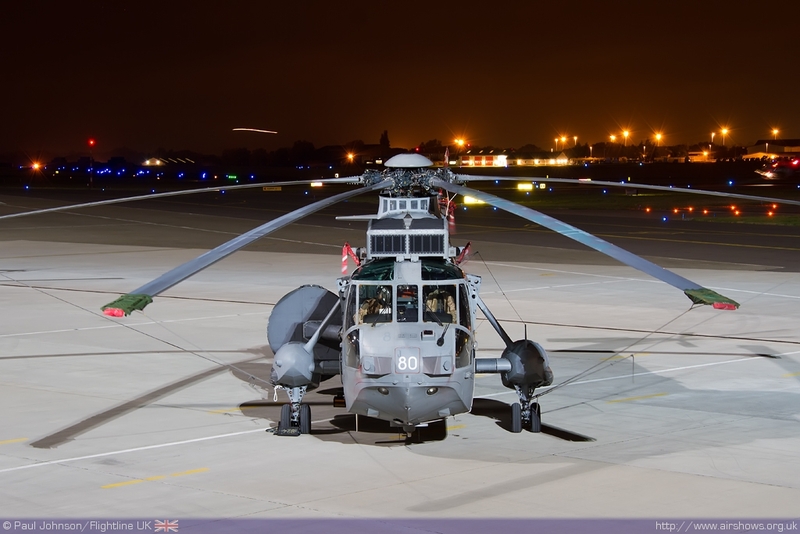 It was originally planned that the 2012 A109 Solo Display aircraft would be attending with its striking special scheme. 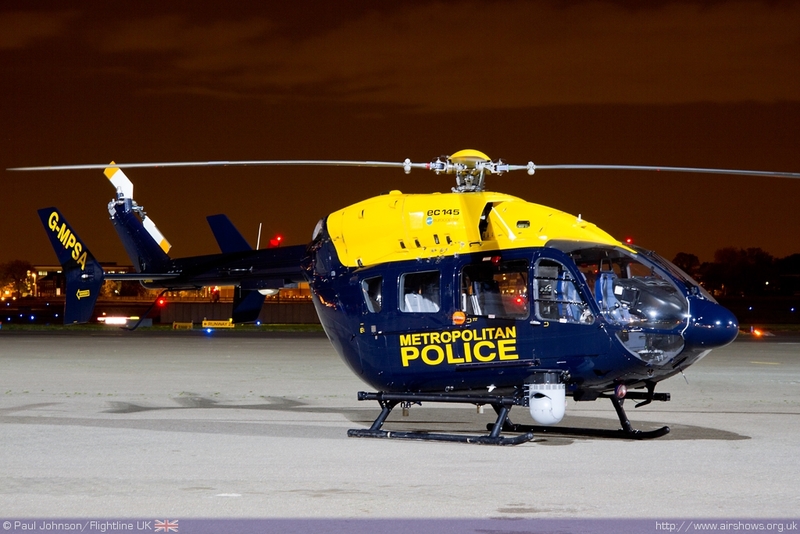 However it went unserviceable in the days leading up to the event and was replaced by the aeromedical equipped A109BA. 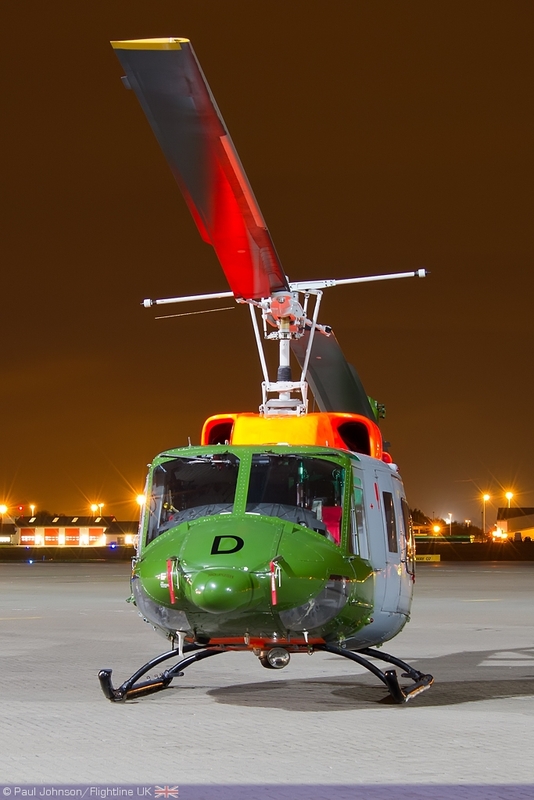 This aircraft features modified doors which allow a standard stretcher to fit within the cabin and not often seen in public so was a great addition. As ever, Phillip Dawe and his team put on a superb event providing plenty of opportunity to the photographers. Nightshoot XIV will be held on the 14th March 2013.